Are you craving for a spicy cheesy something that you don’t know what it is? I guess you need to try this bacon wrapped chilies stuffed with cheddar cheese. Great for appetizer or snack or you can serve it with your favorite alcoholic beverage to feel the “spicy” taste. Green finger chilies are not hard to find. It is often seen on your local wet market and it is used on many Filipino dishes like sinigang or bicol express. Usually these kinds of chilies are not spicy and taste like pimiento or sweet peppers but sometimes it is spicy. To cook bacon-wrapped cheesy green chillies; Pre-heat oil in a frying pan. 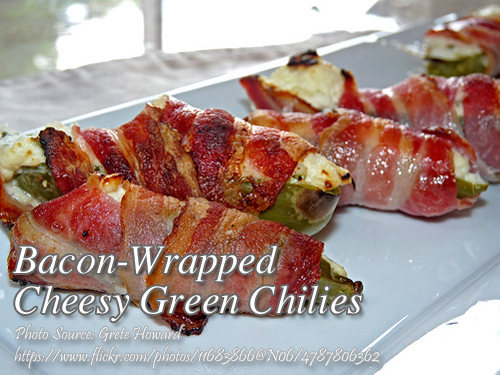 Arrange green chilies, put cheese inside, and wrapped with bacon. Secure it with a toothpick. Do the same on the rest of the ingredients. Fry the chilies and wait until the bacon turns brown and crispy. To make the dipping sauce, mix the mayo with the ketsup. Serve the chilies with the dipping sauce. Pre-heat oil in a frying pan. Arrange green chilies, put cheese inside, and wrapped with bacon. Secure it with a toothpick. Do the same on the rest of the ingredients. Fry the chilies and wait until the bacon turns brown and crispy. To make the dipping sauce, mix the mayo with the ketsup. Serve the chilies with the dipping sauce. great combinations.. fantastic flavor !yes its looks like a bomb ..spicy taste melt inside the mouth. :) and a little bit twist of sweet.. next recipe pls..
Hi Grace, I’m glad you liked the bacon wrapped cheesy green chilies.